Discussion in 'Artists' started by artistebot, Apr 14, 2018. Its time to update my pen comparison. The latest ones all have 4096 pressure levels, and support tilt. No batteries or sync needed...ever! 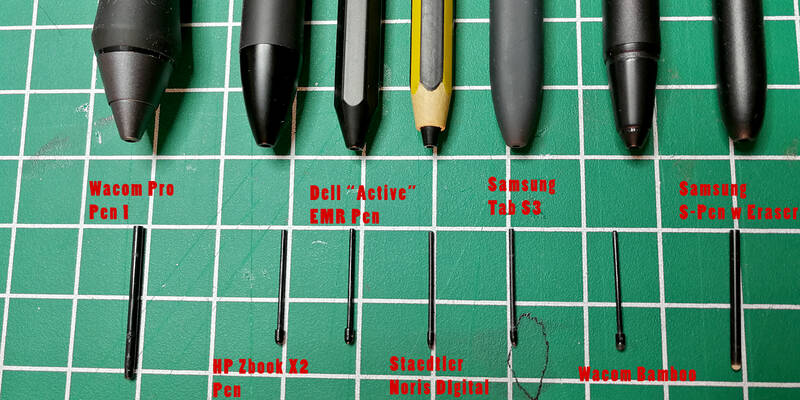 Note the Wacom Pro Pen is NOT compatible with non "wacom" branded products, I included it as comparison. All the tips are replaceable and compatible with others of the same size. The fine tip from the S3 or Noris works in the Zbook HP/Dell Pens and vice versa . 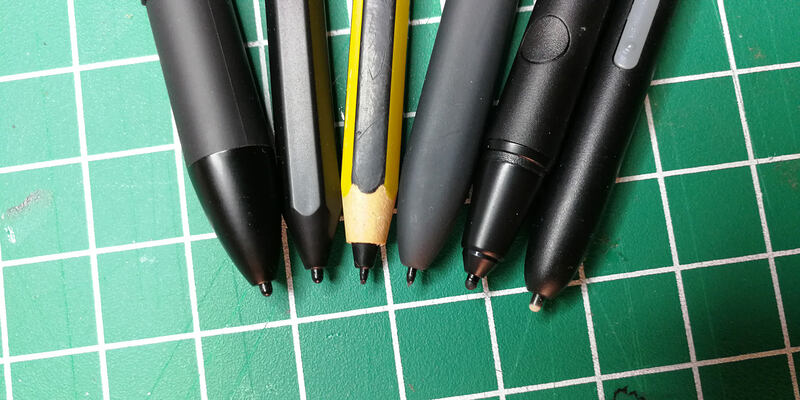 The Wacom Bamboo and Samsung S-Pen w Eraser tips are not compatible with others. While they do work I would not recommend them due to a slight offset, that the newer ones don't have. 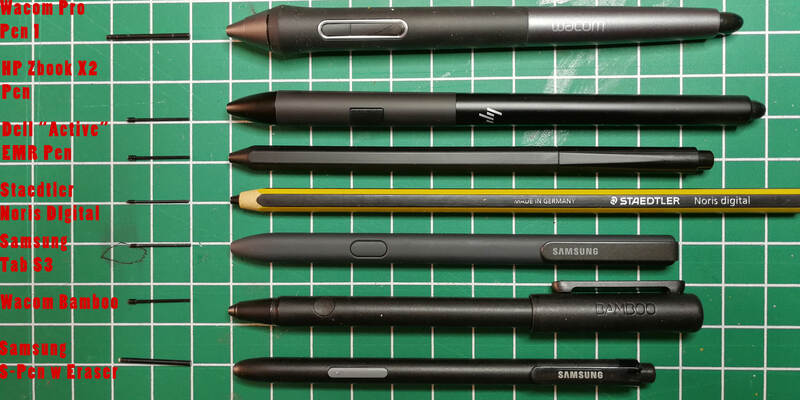 One thing of note in regards to the Wacom Bamboo / Samsung S-Pen w Eraser (as they are the older generation), is that tilt is recognized in the same way the newer pens do, so they may also register 4096 levels of pressure? The really old Cintiq UP-911E--02DD and Fujitsu Lifebook pens do NOT register tilt, and feel much less sensitive to pressure. IMHO the two best Pen/Stylus is the HP Zbook X2 and the Steadtler Noris Digital. ontic00, Tams, HeavyHanded and 7 others like this. Any chance you could do a side by side drawing comparison in clip studio (or photoshop)? Quick question: There are a lot of different Wacom Bamboo pens. Can you give the product code or some specific identifier on the one in your collection? I'm thinking of picking one up. I think it's the Bamboo Smart for Samsung devices, formerly Bamboo Feel IT. IMHO the Noris simply 'feels" the best with good balance. ATIVQ is correct on the Wacom Feel. HP Pen or Dell Pen? Uh, the HP pen does have a side button, it's the plain rectangle in the middle of the rubberized grip area --- wish it was a rocker for two buttons though. Agree the Noris feels the best. Ok....somehow I totally missed the release of that Dell EMR Pen. Its using the same nibs as the Zbook x2....so this Pen should be fully Samsung/S-pen compatible. The end of the pen though.....is that an Eraser or Button? I had some questions as I was looking through Amazon. I have a samsung notebook pro 15" . it uses Wacom EMR technology. I actually use my old Fujitsu stylus since it has an eraser and feels better to use. I saw some tablets from Parblo and others with options to buy their stylus separately. For example which looks the same. Do you know if they work with the Samsung? Also I see they are called Passive Pen instead of EMR. is that the same thing? BTW, I also had purchased the Norris STAEDTLER pen. It felt light, but broke easily. Also they really should have an eraser. Web/Interactive by day/ Illustrator by night. I found the old Penabled styluses like your Fujitsu had a significant and incompatible offset which I couldn't get past without too much stretching. That sucked, because I totally agree, those pens were just beautiful, both in their feel as pens, and in their pressure curves! The Wacom one has a great line quality; the pressure curve is different from, and I think slightly preferable, to the Smardi pen, (though that's subjective. I just find when I start drawing with it that I blink and think, "Hey, I like this!"). But, despite its nice design and everything, I always find myself drawn back to the hefty weight and comfort of the Smardi pen holder. If the button were a little easier to find without looking, it would be very close to perfect. They both have buttons which are a little hard to find just through feel. I'm thinking of doing some plastic surgery to one or both in an effort to address that, but haven't yet, as the problem isn't such that I care enough. Anyway, as to your question, I don't know about those replacement pens you mentioned, but if they do work as decent replacements for the old Penabled standard, then they will presumably have the same offset problem. Too bad! It was a great time for pens. -As much as I'm digging my Samsung, every now and again, I check eBay for old Tecra M4's. They were hands down my favorite drawing computer. Sadly, I think that beast is well and truly extinct now.